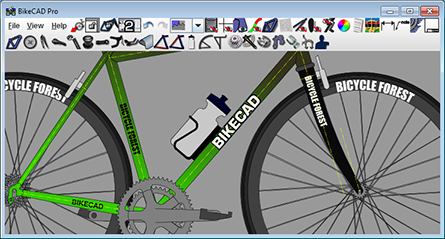 There are three options for saving a bitmap style image from BikeCAD Pro. The three options are shown below. This option exports an image of the view exactly as seen in the BikeCAD display above. This option exports a scaled image of the view seen in the BikeCAD display above. This image could be larger or smaller than the original. This option exports a scaled image of the entire bicycle seen in the interface at the top of the page. Note that you also have the option to choose between BMP (Windows bitmap), JPG (Joint Photographic experts Group) or PNG (Portable Network Graphics) image formats.